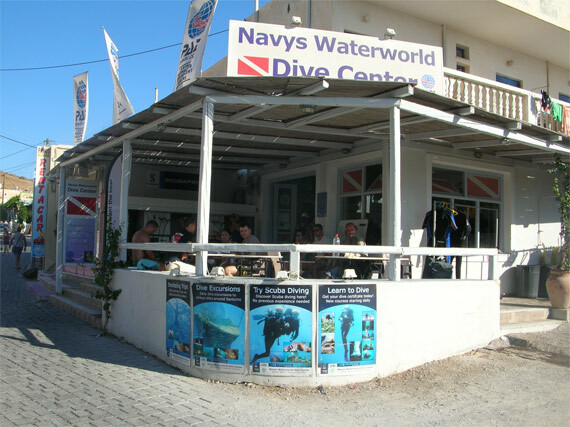 Navys Waterworld is located one street away from the main strip in Kamari on Santorini’s east coast, in the shadow of the mountain of ancient Thera. Generally speaking, Greece does not have a great international reputation as a dive destination. Until a decade ago there were restrictive licensing laws about dive operators. Lousy fishing practices did the rest. But things have changed and Greek locations – of which there are thousands – are being hastily conquered by underwater explorers. Santorini is one of a group of islands called the Cyclades. It isn’t big, nor is it perfectly formed, resembling (on the map, anyway) a backwards ‘C’. The inner part of this curve is a dramatic high cliff edge, from which the land slopes away downwards, covered in settlements and vineyards – finally into a beach. The well-documented and up close, glaringly obvious reason for the island is because it’s actually a collapsed super volcano, thought to be the site of the Minoan eruption that wiped out a civilisation. Navys Waterworld is based in Kamari, one of the resorts on the eastern coast, or outer edge of the volcano, if you prefer. I meet Navys owner and manager, a friendly chap called Robert, who greets us with a beaming smile and firm handshake. It’s 9am but the mercury is already nudging 30 degrees and the dozen or so divers assembled are setting up their kit. It’s a hive of activity, as the team lift cylinders onto carts and wheel them towards Kamari beach for loading onto the two boats – both RHIBs. If there’s a downside to diving on holiday, it’s the experience levels of those you’re diving with. Half our group are doing a Discover Scuba Diving (DSD) course this morning, while those on our boat mainly are on a romantic Santorini holiday and just fancied a change of scenery. That said, a few are clearly regular divers, and are busy fiddling with their computers and cameras. First dive site takes us south, down and around the bottom end of the island, past some striking geomorphology. Our driver points out ‘The Red Beach’ and The White Beach’, which are named after their mineral colourings. We park in the lee of a huge magma flow, thankfully that has long ago solidified and cooled. Compared to diving on a UK club RHIB, this one feels spacious to me. Ordinarily, the boat handler would be hassling everyone to ‘get on with it’, ‘stop faffing’ and help each other’, as time and tide waits for no man. Instead, everyone politely takes it in turn to kit up, and I’m chomping at the bit to get going. 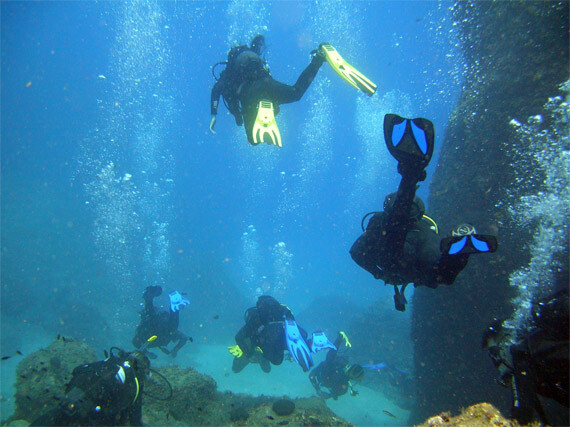 Cavern diving is always fun and we swim through and around, single file style. In one cave is a plaque placed by the Cousteau Divers foundation to mark the 101st anniversary of Jacque-Yves Cousteau’s birth. 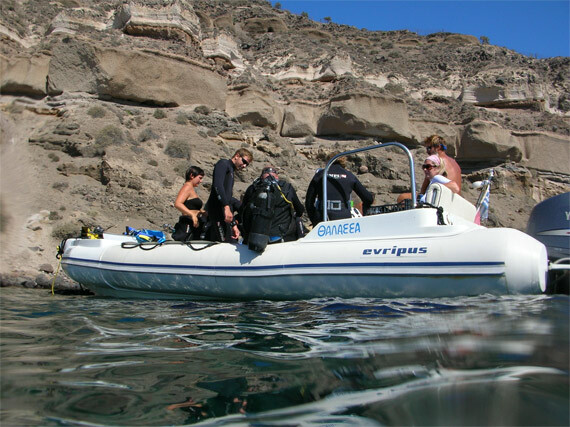 The Cousteau link to Santorini is a personal one, as Robert explained: “Pierre-Yves Cousteau was in our dive center to train as Assistant Instructor, so we become very good friends with him. 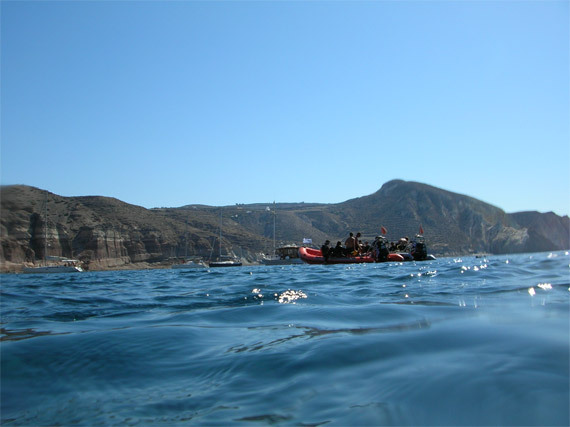 Second dive with Navys is between Perissa and Kamari, back around the easternmost point of the island and in the shadow of the mountain. This is the best spot on the island for seeing marine life, and turtles have been spotted only a few days before – one of the beaches on the island is a turtle nesting site. No turtles today, but we swim down to about 20 metres and around huge pinnacles, the huge cliff faces towering above and behind. The sands are pure white in the shimmering azure blue sea, set against black rocks of formed by volcanic violence. 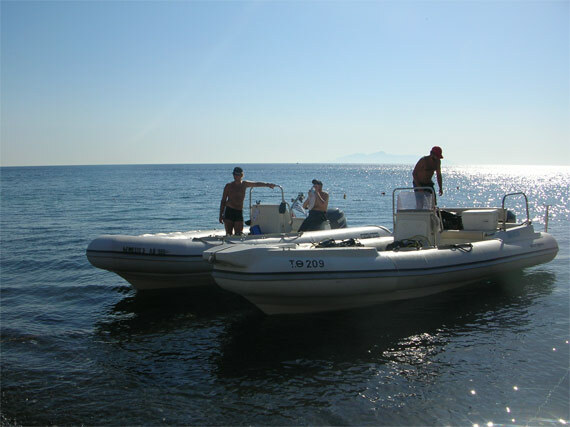 Navys are a friendly bunch, with dive masters and instructors from both Greece and the UK. One criticism levelled at operators on the island is that they’re too ready to take money for poor practices: rush trips along, and lump snorkelers in with divers. I didn’t see any evidence of this, in fact quite the opposite – and the unhurried atmosphere is exactly what you want on a holiday dive. Navys’ kit all looked new and well maintained, including the boats, and the staff were helpful, knowledgeable and attentive at all times. 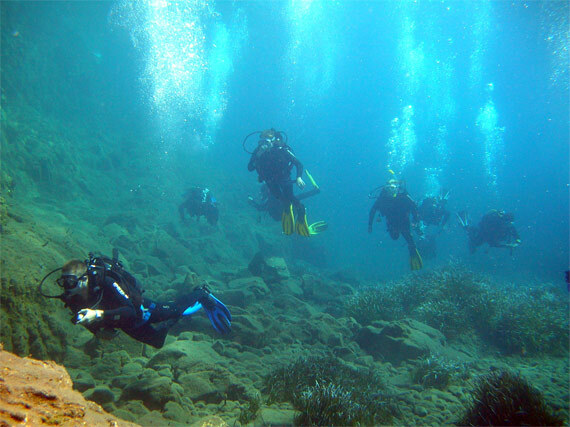 From a diving standpoint, Santorini reminds me of Malta – lots of wall, rock and cavern diving. 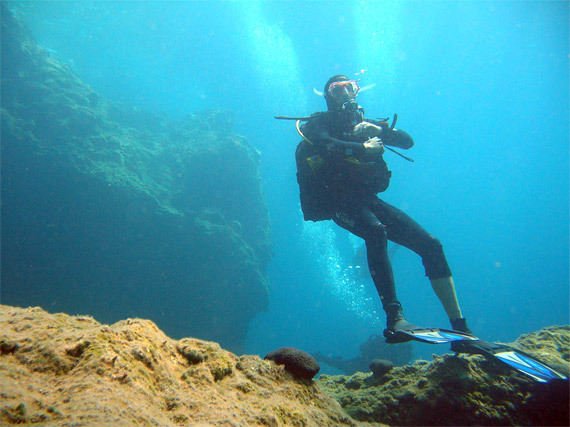 Could it become the next Malta, which is a popular destination for UK divers, year-round? Possibly, and Navys offers PADI TecRec courses already, which are sure to sit well with the technical crew looking to train during the winter. It’s no more expensive than Malta and scarcely much further away, either. I’d certainly like to return and see more of the island from below, as the guidebook boasts of almost 40 individual dive sites. When I do, Navys Waterworld will certainly get my business.